Welcome to Sealterbloind's Art Shop! 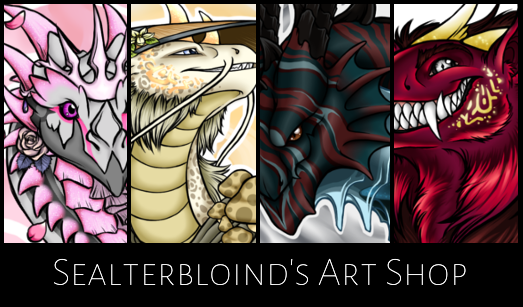 I'm offering you colored and shaded quality busts of your precious dragons! Base price is 1000 gems or 1 million treasure. This covers simple apparels and/or simple accents and skins. Prices for dragons with busy apparels and/or detailed accents and skins start from 1500 gems or 1,5 million treasure and they can go way beyond. Adding simple symbol or "effect" in the background doesn't cost extra. Changes the breed of one dragon to Wildclaw. Wildclaw dragons are a rare breed with a 35-day breeding cooldown. Cannot be applied to dragons already on a cooldown. A jewelry box filled with the Citrine, Tanzanite, Onyx, Emerald, and Sapphire Talonclasp Pendants. A savings of ten percent! Bantam Fangar lines have been bred to produce a smaller, stockier cat. Their soft purr can soothe hatchlings to sleep. A wreath of crisp, yellowing leaves that sits atop the head. Crowns such as these are prized possessions as the branches they are made from come from trees that take hundreds of years to mature. A fine piece of soft pink silk, elegantly draped to echo the movements of the dragon wearing it. A cascade of red rose petals fall around you at all times: inexplicable! A cascade of marigold petals constantly fall around you. Inexplicable! A cascade of sakura petals fall around you at all times: inexplicable! A fine piece of deep red silk, elegantly draped to echo the movements of the dragon wearing it. A scroll that will change the tertiary gene of one dragon to Firefly. This item can only be used once and will disappear after it has been applied. A scroll that will change the primary gene of one dragon to Pinstripe. This item can only be used once and will disappear after it has been applied. A scroll that will change the secondary gene of one dragon to Trail. This item can only be used once and will disappear after it has been applied. Quetzeels are a sign of good luck for fishers, as they're hunting patterns closely mirror the peak breeding seasons of many species of fish. Would-be charmers would be wise to invest in a clay pot; these spiny serpents shred wicker baskets. Absolutely crappy beautiful Ms Paint art! Right here!